Above: Waiau River Mouth - Sourced from NZTopo50-BU26. Crown Copyright Reserved. On both maps one blue square represents one square kilometre. Andy Black with a big 11.9 kg salmon taken from the Waiau River. Road down to the mouth is a problem unless you have a jet boat. With a jet boat, the ride from Waiau East Road to the mouth takes only about ten minutes or so. River access upstream of Leamington Road is also difficult as there are no road access points. A Four-wheel-drive vehicle is a definite advantage if you want to avoid a good deal of walking to good casting spots. 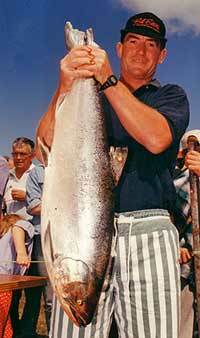 Many Canterbury anglers like to fish for salmon at river mouths. Unfortunate topography including a narrow gorge in the lower river and complete absence of road access makes fishing the Waiau River mouth the preserve of the jet boat equipped angler. A salmon taken in the Waiau River. Photo Linley. In the Eastern Zone below the Hope River confluence fishing is permitted all year with a limit of 2 trout and 2 salmon. Natural bait fishing for trout is permitted in the Eastern Zone only. Bait fishing is only permitted in the Eastern Zone between 1 October and 30 April. The Waiau River marks the northern boundary of Canterbury’s tremendous wild sea-run salmon fishery. Generally speaking, few Christchurch salmon anglers fish the Waiau River. Locals from the Cheviot area are at a definite advantage when it comes to awareness of recent salmon runs. 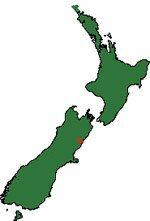 Other than by crossing privately owned farmland (for which you must obtain permission from the land-owner) the mouth of the Waiau River can only be accessed by jet boat. It is, however, a relatively short trip by jet boat from the State Highway One Bridge downstream to the mouth. 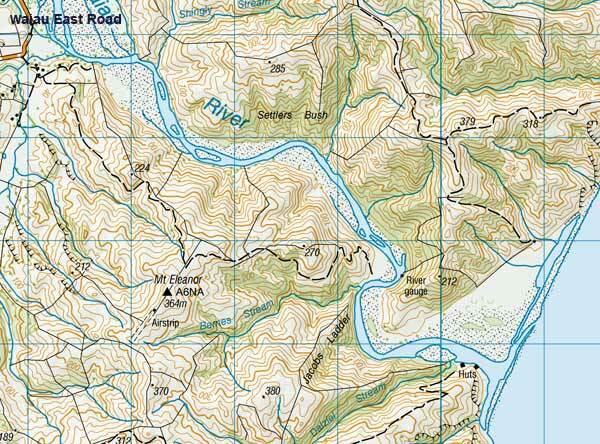 Above: Waiau River Mouth – Sourced from NZTopo50-BU26. Crown Copyright Reserved. On both maps, one blue square represents one square kilometre. Waiau River at Spotswood – Sourced from NZTopo50-BU26. Crown Copyright Reserved. Few Christchurch salmon anglers bother to make the 135km journey north to fish the Waiau River, especially as they would have to cross the Waimakariri and Hurunui Rivers on the way! All colour ebook with 144 pages. There are over 198 photographs in The Complete Guide To Surfcasting, most of which have never been published before. Order your own .pdf version now for just NZ$11.99 Instant Download.